Feeling stressed? Overwhelmed? Can you spare 5 minutes? Because 5 minutes will change your life. During the holidays, many of us have too many responsibilities (and bills) to sneak off for a weekend getaway, much less for a two-week vacation. So here’s a better plan: The 5-Minute Vacation. And it won’t cost you a dime. First, you need to find a place where you won’t be disturbed for 5 minutes. While you’re seated on the throne, close your eyes and imagine yourself releasing all your stress. All your worry. See it flowing out of you and into the plumbing. Take deep breaths. Relax your neck and shoulders. Next, spread your arms. Imagine that every good thing, every good feeling, is flowing down from the Center of the Universe into your fingertips. Hug yourself. Soak in all that radiant goodness. You deserve it! Now you’re ready for your dream vacation. Allow your mind to go on a fantasy getaway. It could be snowboarding in the Alps; sunbathing in the Caribbean; waving to whales from your Alaskan cruise ship. Wherever you go, make this journey as vivid and real as you possibly can. Imagine what you would smell and hear. See the shapes and colors. Put yourself at the center of this scene, smiling and laughing, happy and relaxed. When you open your eyes, you’ll feel like a new person. Your mind will be clear, and your body will be free of tension. Best of all, you’ll be empowered to take on your day! In the spirit of giving, I’ve created a 2 minute movie with beautiful music and positive affirmations to help you fall into a relaxing sleep – at any time of the year. Be sure to save the video link and view it each night before you retire. Click here for the link. 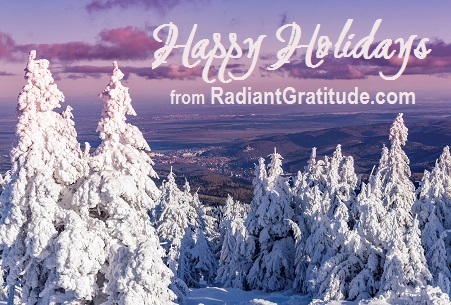 Peace and blessings to you during the Holiday Season – and always. P.S. 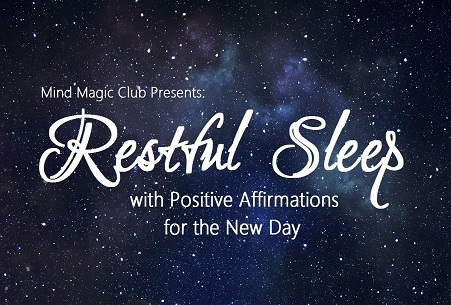 If you like our Restful Sleep video (below), you’ll DEFINITELY want to check out our Mind Magic Club. Learn more here!